RACHEL RAY. A NOVEL. SEVENTH EDITION. WITH A FRONTISPIECE BY J. E. MILLAIS, R.A.
Oh, Dolly, do not speak with that terrible voice, as though the world were coming to an end,'' she said, in answer to the first note of objurgation that was uttered; but the notes that came afterwards were so much more terrible, so much more severe, that Rachel found herself quite unable to stop them by any would-be joking tone. 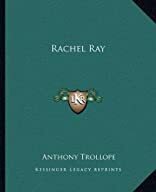 About Anthony Trollope (Author, Reader) : Anthony Trollope is a published author and an editor. Some of the published credits of Anthony Trollope include Rachel Ray (Penguin Classics), The Eustace Diamonds, Barchester Towers.